Supporters of the program are passionate, arguing that the heavily subsidized insurance is an essential “safety net” – the only thing standing between farmers and financial ruin when bad weather slashes crop yields or market prices fall. But a more sober analysis shows that it’s a complete misnomer even to call the program “insurance.” It works nothing like the private insurance market because the premiums that farmers pay cover just a small portion of the actual cost of the coverage. Moreover, what crop insurance considers a “loss” that triggers a payout bears little resemblance to the actual financial losses a farm family has experienced. Hefty taxpayer subsidies pay about 60 percent of the premiums, all the costs of administering the program and a large share of the claims payouts. The cost to growers is so low that over time most can expect to collect far more in payouts than they pay in premiums. In other words, most farmers make money by just by buying crop insurance. That makes buying the “insurance” a lot like playing a very generous lottery. Making more in payouts than they pay in premiums is not a sure thing, but the odds are in the growers’ favor because premiums are so over-subsidized. It amounts to placing a bet in a casino where the size of your bet is doubled with the house’s money. 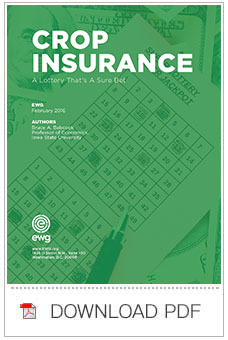 And, in fact, recent research confirms that farmers do indeed treat their crop insurance purchases more like buying into a subsidized lottery than buying risk management. A good way to measure just how little federal crop insurance now resembles a safety net is to calculate the average annual rate of return that farmers receive on their premium dollars. The average rate of return on crop insurance for all farmers in all states between 2000 and 2014 was 120 percent per year, meaning farmers received $2.20 back in claims for each dollar they paid in premium. In aggregate, farmers have enjoyed positive rates of return every year, ranging from 29 percent ($1.29 for every dollar of premium in 2007) to 324 percent ($4.24 for every dollar of premium) in the 2012 drought year. Texas and 237 percent in Oklahoma. In general, rates of return are lowest in the Corn Belt and highest in states in the Great Plains and the Southeast. Ending the Department of Agriculture’s so-called “direct payment” program was touted as a major accomplishment of the 2014 farm bill because money would now go to growers only when they suffered an actual “loss.” Despite the variability, however, the data show that at least some – and perhaps many – farmers actually make more money on crop insurance than they ever received in direct payments. It's no surprise, then, that most farmers now participate in the program – an important goal that Congress wanted to achieve. But there is a way to achieve that goal while reducing the cost and distortions created by over-subsidized premiums: Decouple the size of the subsidies from farmers’ insurance-buying decisions. Suppose, for example, that farmers received a fixed “risk-management” co-payment for each acre they farmed, without regard to what crop they planted or how much and what type of insurance they bought. In that scenario, farmers would more carefully consider how much insurance they actually needed, because more costly coverage would be paid out of their own bank accounts, rather than having 60 percent come from taxpayers. Farmers would stay in the program to capture the fixed co-payment, so the Congressional objective of high participation would be met. Depending on the size of the fixed payment, the result could be a dramatic reduction in the program’s cost. With decoupled subsidies, farmers would buy less insurance, the amount of risk transferred to taxpayers would fall dramatically and the incentives to plant on environmentally sensitive land would diminish. Federal crop insurance can and should be a fiscally and environmentally responsible safety net that steps in when farmers suffer financial losses that threaten the viability of their business. But that is not what the program is today. Some will argue that the big regional differences in rates of return mean that farmers in low-risk areas pay too much compared to those in high-risk areas. But what that really means is that farmers everywhere pay too little and taxpayers pay too much – far too much in high-risk counties. The crop insurance program doesn’t have to be a lottery where the odds favor growers at the expense of taxpayers. Congress needs to step up and reform the program so that it works for taxpayers and the environment as well as it does for farmers.